If you are looking for the best backpacks for teachers, here’s some things you should know. Teaching is a very challenging, yet rewarding profession. Not only is it intellectually demanding — it is physically demanding as teachers often have to lug around a wide variety of items including lesson plans, books, laptops, and notepads. Carrying these items is made easier by purchasing a well-made teacher’s backpack with useful features that make storing and finding items simple. 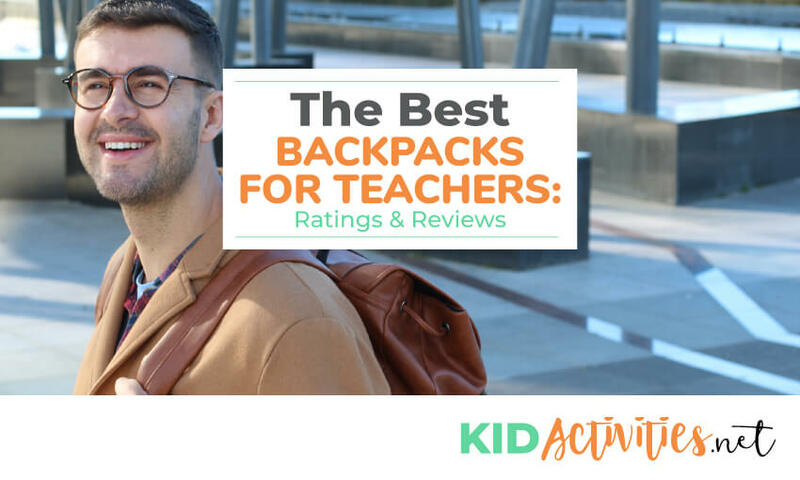 This guide will offer some tips for finding the perfect teacher’s backpack and we’ll share 6 great backpacks for both male and female teachers. What types of teacher’s backpacks are available? What kinds of items do teachers often carry around? As you can see, teachers often have to carry a lot of items with them when they go to work! Having a well-made backpack makes organizing and carry these items much easier. Utility backpacks are designed with functionality in mind. They tend to have features like numerous internal zip pockets, thick straps, hooks for attaching items, and external mesh pockets to hold water bottles. Some utility backpacks will have a technological focus with internal pockets for both laptops and tablets. Utility backpacks are often used for hiking, bike riding, and other activities where you are carrying a lot of gear. They tend to be made from synthetic materials that are lightweight and waterproof. While these materials are very functional, they sometimes don’t look as good as other types of material like canvas or leather. Utility backpacks also tend to feature a lot of zippers, pockets and hooks, which are not always useful for a teacher – in some cases they make it difficult to find what you are looking for. Business backpacks are designed to carry the tools you might need for a business meeting or business trip. This includes items like books, laptops, tablets, phones, paper documents, pens, media files and personal organizers. Business backpacks tend to have a more refined and professional look compared to a utility backpack. Instead of being covered in pockets and buckles, they often have a clean exterior with most pockets being inside the backpack. In addition to using synthetic materials, business backpacks sometimes feature canvas and leather to make the backpack more attractive. 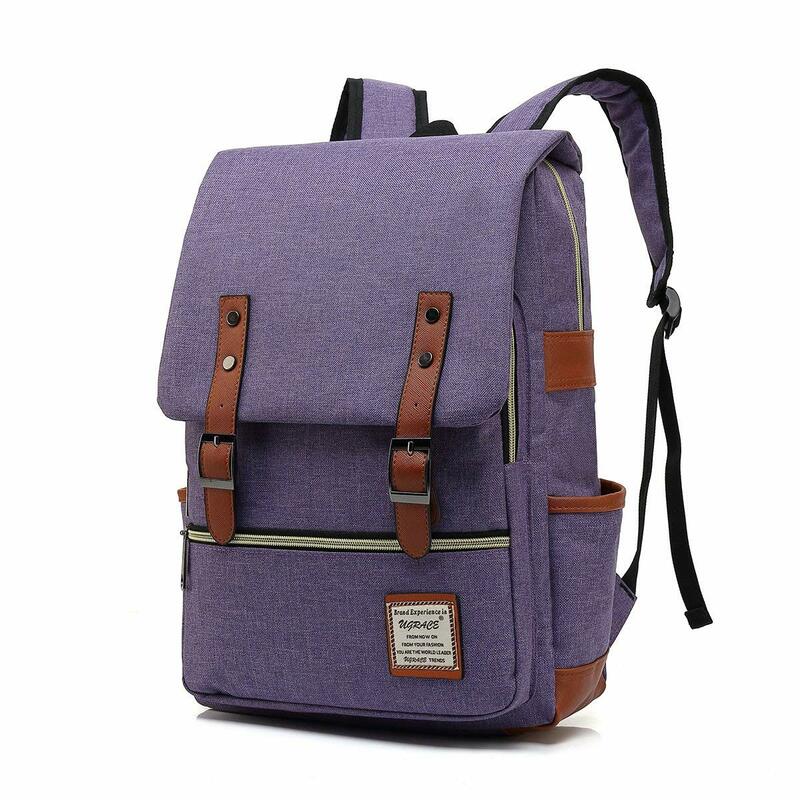 As the name suggests, a fashion backpack’s primary goal is to look great! Fashion backpacks are available in a wide range of materials, designs, and colors. Although their primary objective is to look fantastic, they often come with useful features including phone and laptop pockets, zip pockets for smaller items, and waterproof sections. A traditional backpack is a general purpose pack that blends fashion elements with functionality. They work well for many kinds of tasks including hiking, riding, and carrying the items you need during the school day. Many teachers enjoy using leather or canvas backpacks designed in a vintage style. These backpacks are usually very durable, can handle heavy loads, have a large capacity and plenty of pockets. 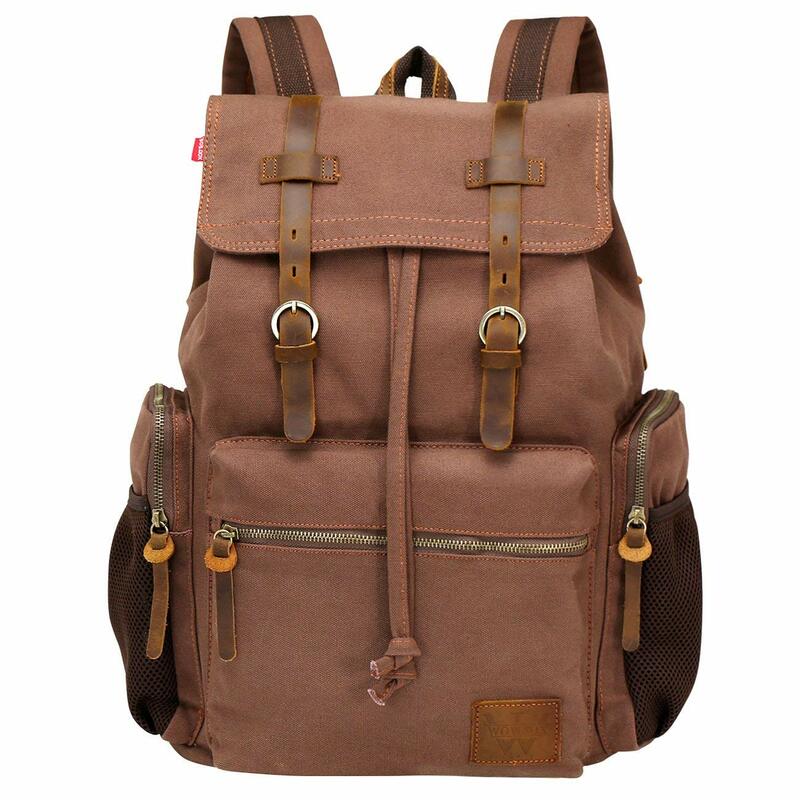 One example of this style of backpack is the S-ZONE Vintage Crazy Horse Genuine Leather Backpack. 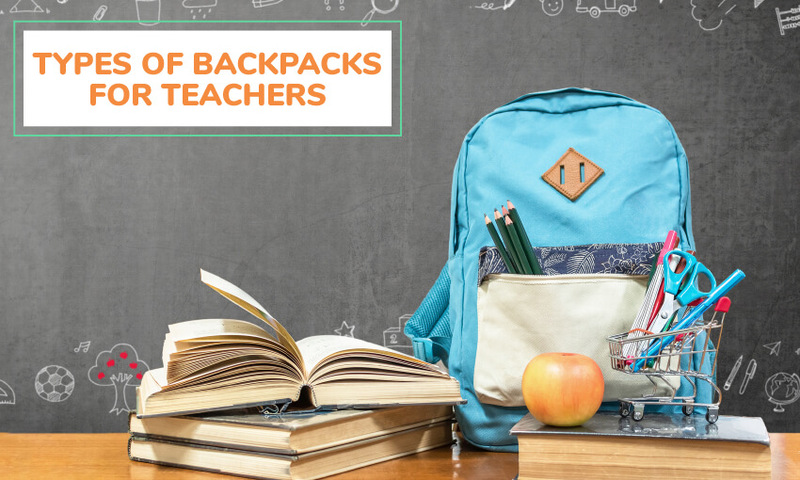 Here are a few useful tips to help you choose a teacher’s backpack that is highly functional, useful, comfortable, and attractive. Teachers may need to open their backpack dozens of times each day, looking for lesson plans, pens, and other items. For this reason, it is important to choose a backpack with sturdy zippers and zipper pulls. They will be able to tolerate frequent use each day. Backpacks with higher quality stitching will have greater longevity and are less likely to rip at the seams. Some backpacks will have double or triple stitching to make high stress areas on the backpack stronger. The types of materials that the backpack is made from will determine how much it can protect its contents and how likely it is to be torn. We’ll share more on materials in a moment. Some backpacks will come with handles, wheels, hooks, and mesh pockets. The durability of these components should also be assessed. What material is the backpack made from? The type of materials used to form the backpack will help to determine how durable it is, how water resistant it is, and how long it will last. It will also determine it’s weight. When it comes to the thickness and durability of fabric materials, you will need to look at their Denier rating. Denier represents how thick each fiber is within the fabric, with one denier being the same thickness as a strand of silk. That means a backpack with material rated 400D has fibers with the thickness of about 400 strands of silk woven together. Cordura is a mixture of fabrics, but it is usually made from nylon combined with cotton. It is lightweight, extremely durable, and comfortable. It is often used for military uniforms, bags, luggage cases, and backpacks. The main downside to Conndura is its cost. Cotton canvas is an affordable and breathable natural fabric often used to make backpacks. It can be quite durable, but it usually isn’t very water resistant unless treated with a coating of some sort. Nylon is a synthetic fabric that is quite strong, affordable, and versatile. It is also static resistant, abrasion resistant and mildew resistant. Nylon is softer than polyester. The downsides of nylon include higher cost, susceptible to UV damage, it stretches when wet, and it is not a breathable materials. Ripstop nylon is woven using a special reinforcement technique that prevents a rip from continuing easily. Having ripstop nylon can be very useful on a backpack as it stops small tears destroying the back pack. This is another synthetic material. It is more durable than most natural fibers of a similar size, but not as strong as nylon. It dries quickly, won’t shrink, and is inexpensive. The main downside of polyester backpacks is that they do not feel comfortable against the skin and the material does not breathe. Leather is an all-natural material that is extremely durable, naturally water resistant, and attractive. The downside include its heavier weight and expense. It is important to choose a material which you like the look of and which is within your budget. How much capacity does it have? The backpack you choose should be big enough to hold the kinds of items that you need each day. Take an inventory of the kinds of items that you use every day and look for a backpack that can hold them all. If you take a laptop to work, jot down its dimensions and check that the pockets in any backpack you are considering will accommodate it. If you take a lunchbox to work, make sure the backpack is big enough to squeeze it in alongside any other items. How adjustable are the straps? If you often take a lot of material to work with you, your backpack may become quite heavy. Carrying a heavy backpack can be uncomfortable and may even contribute to back pain. To avoid this issue, look for a backpack with adjustable straps. They will help you distribute the weight of the backpack evenly across your back — relieving pressure and avoiding any unnecessary pain. It is particularly important to have adjustable straps is particularly important if you walk, run, or cycle to work each day. Utility backpacks usually have the most adjustable straps because they are designed for hiking. In some cases, they will even come with an adjustable hip or waist strap to place more weight on the hips and pelvis instead of the shoulders. They also tend to have straps with thicker padding, which can be useful if you often get sore shoulders. Some utility backpacks will have an internal frame to distribute weight more evenly. If you regularly carry lots of books around, consider this type of backpack. While examining the straps on a backpack, take a closer look at how well they are stitched. Backpack straps are one of the most common points of failure on backpacks, particularly when carrying heavy loads. Look for reinforced stitching and thick, durable material for the straps. Is the back panel padded? Another feature that often determines the comfort level of a teacher’s backpack is its back panel. Some backpacks will have additional padding on the back panel or channel to allow ventilation. This will help your back remain cool and comfortable on warmer days. It is unlikely that you will need a waterproof backpack unless you intend on going trekking with it. However, having a backpack made from water resistant materials is usually a great idea. See the water resistant section below to learn more. Many high-quality teacher’s backpacks have internal pockets that are surrounded by foam padding. While the padding does reduce the total amount of space available inside the backpack, it can protect your more valuable or fragile items. It also helps to ensure your lunch doesn’t get squashed! Is the backpack water resistant? Another reason to opt for a water resistant backpack is if you carry electronic equipment. If you have an expensive laptop or iPad in your backpack, having additional protection for it is usually a good idea. If you cycle or walk to work, purchasing a water resistant backpack can also pay off. However, If a backpack you like isn’t water resistant, you can always purchase a rain cover for it. How water resistant a material is will be measured in one of three ways — Hydrostatic Head (HH), water column or waterproof ratings (measured in mm). The denier rating will also play a role, as it determines how thick each fiber is. If the fibers are very thick, there will be less holes for water to penetrate. Some backpacks use materials like polyester and nylon fabrics which are not waterproof. However, they apply a coating of silicone, PVC, PU, or TPE coatings to give the backpack waterproof properties. Some manufacturers will also add a teflon or Durable Water Repellency (DWR) coating to the exterior of the backpack to cause water to run off before it gets a chance to penetrate. Look for these features if water resistance is important. Is the backpack travel friendly? If you often find yourself traveling to other locations for work, consider buying a backpack that is checkpoint friendly. Checkpoint friendly backpacks are ones that can be searched easily by TSA agents. Having wheels and a handle on your backpack can also be useful if you travel frequently. Teachers are typically very busy people who must maintain a high level of productivity. They don’t really have the time to look for a pen in their backpack! That’s why a good teacher’s backpack should come with a variety of organizational compartments and tools to help you store and locate important items. These features should include things like laptop and tablet compartments, water bottle holders, elastic loops for pens, pockets for your earbuds, zippered sections for your phone and so on. Selecting a backpack with these kinds of features can make your life much easier. How secure is the backpack? If you travel to work using public transport or sometimes leave your backpack in an unsupervised location at school, security may be an issue. Teacher’s backpacks often come with locks or zippers that can easily have locks attached to them. Some backpacks even have hidden pockets for storing valuable items or RFID protection, which conceals electronic information that criminals may attempt to steal wirelessly. Being able to secure your backpack will help you keep sensitive documents and valuable personal items safe. Do you like its appearance? There is no point spending a lot of money on a fancy backpack if you hate its appearance! Look for a backpack that you love the look of. There are hundreds of models with different sizes, colors, shapes and designs. Take your time and find a backpack that you are happy to wear in public. If you take a bus to work each day, you might prefer to have a smaller backpack that is easier to handle on public transport. Spend a couple of minutes thinking about the kinds of tasks you perform before, after, and during the work day. Do you get a coffee or a bottle of juice on the way to work each morning? Would it be helpful to have a bottle holder on your bag? Do you read a book or use a tablet while traveling on the bus to work? Having a front pouch might be handy for quickly pulling out your book or tablet. Do you often carry a large amount of student work between your home and school? You may need a larger backpack with additional capacity. 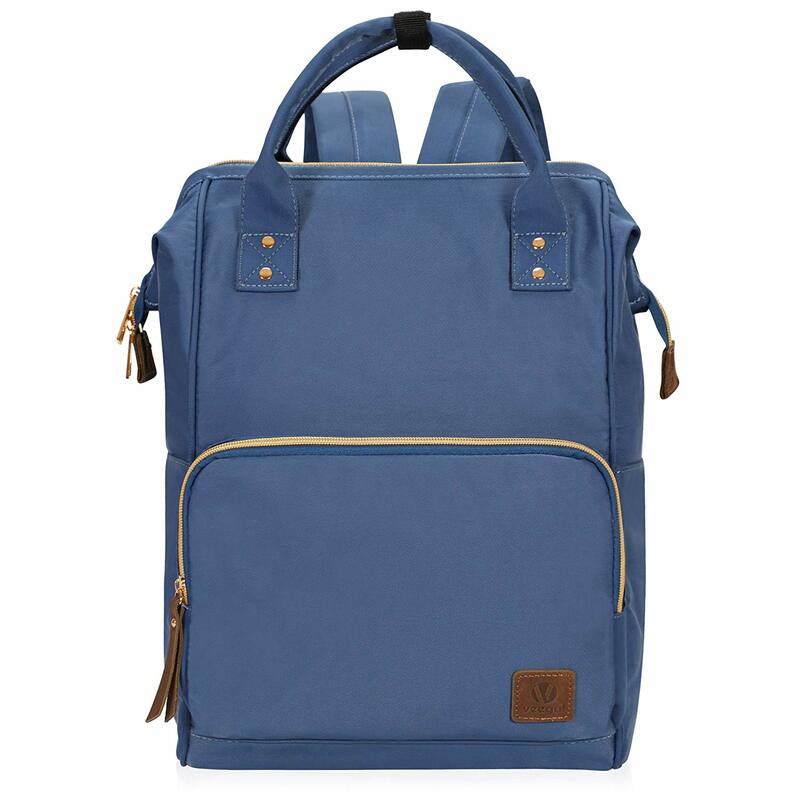 This stylish unisex teacher’s backpack is packed with features, well made and very affordable. It is crafted from premium tear resistant Oxford fabric that looks fantastic. This fabric has a quilted polyester lining which improves its water resistance slightly. 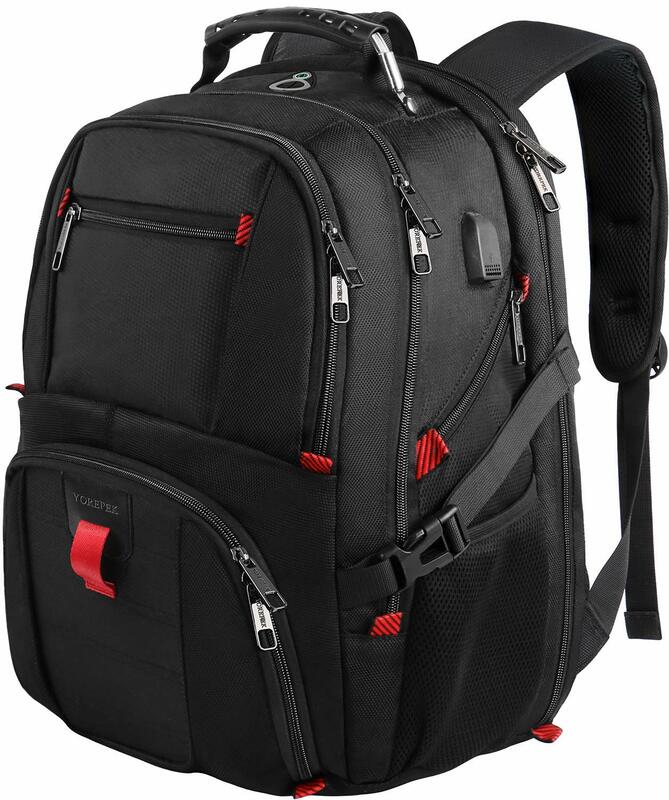 If you need a larger backpack that has more pockets, this KUPRINE Laptop Backpack is an excellent choice. Measuring 18.9 x 14.5 x 4.7 inches, this backpack is packed with pockets including 3 main pockets, 8 inner pockets, 1 mesh pocket, 2 front quick access pockets, 2 side pockets, and 1 back pocket. This makes it simple to separate the different items that you require each day, helping you remain organized and to quickly find what you need. 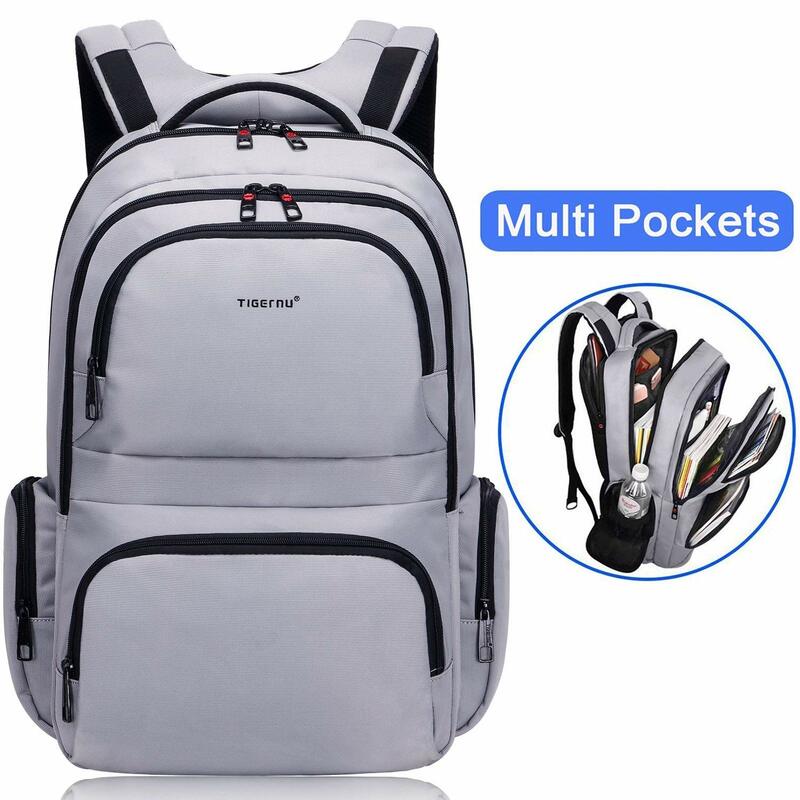 This backpack has some useful anti-theft features including a hidden pocket and separate laptop compartment so criminals don’t see your laptop when you open the bag. It also has a theft proof combination lock and durable metal dual zippers. It is made from water resistant Nylon Fabric with metal zippers. This provides excellent durability and water resistance. This cute backpack is made from scratch-resistant nylon with a high level of water resistance. Measuring 14.9”x11.1”x5.9″inches, it has a capacity of 16.5 liters. It has a large main compartment that can easily hold a tablet or 13” laptop. There are several other internal pockets perfect for holding your phone, pens, lunch and other small items. Another two pockets are on the sides of the sides of the backpack and there is a zippered front pocket ideal for an iPad mini. The nylon material is soft and breathable, plus there are leather patches on the exterior to improve its appearance. The padded straps are quite comfortable and reinforced for longevity. This is a durable and feature-packed utility backpack from Yorepek. It is an excellent choice for teachers that take a lot of course materials with them to work each day. It contains over 20 pockets include 3 spacious main compartment pockets. There are also numerous hidden pockets ideal for valuables and sensitive documents like passports. Measuring 19.0” x 14.6” x 10.2”, this backpack has a capacity of 45 liters. It can hold 17” laptops and has enough room for many other electronic devices. It is made from high quality polyester fabric with high density nylon lining. It is a very comfortable backpack with thick shoulder straps and a padded back. It is also TSA approved backpack, which is useful if you travel often. This attractive backpack has plenty of features and is very comfortable to wear. Measuring 8.45” x 15” x 17.7”, it is made from heavy canvas fabric along with sections of leather. It includes multiple inner organized pockets, a front outer pocket, side pocket, cushioned laptop section and additional rear zipped pocket that is ideal for a tablet. It comes with very comfortable adjustable shoulder straps that are wider than normal to reduce shoulder fatigue. 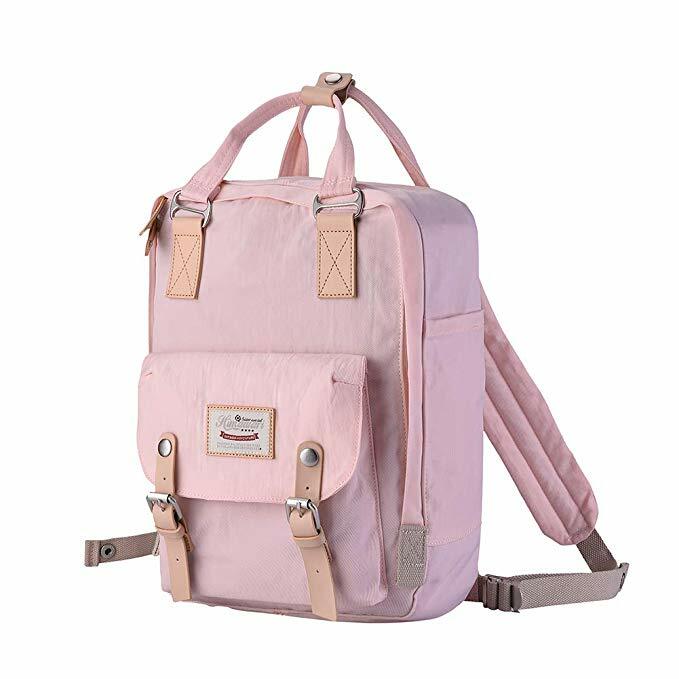 This is a stylish fashion backpack that is also very functional and useful. It is made of high quality nylon fabric that is water resistant and soft on the skin. It features two side pockets, a large front zipper pocket, and an internal security zipper pocket. The vertical zipper in the backside makes opening the main compartment easy. The main compartment is quite large with plenty of room for books, a laptop, supplies and clothing. The adjustable padded shoulder straps are quite comfortable and the stitching is high quality.